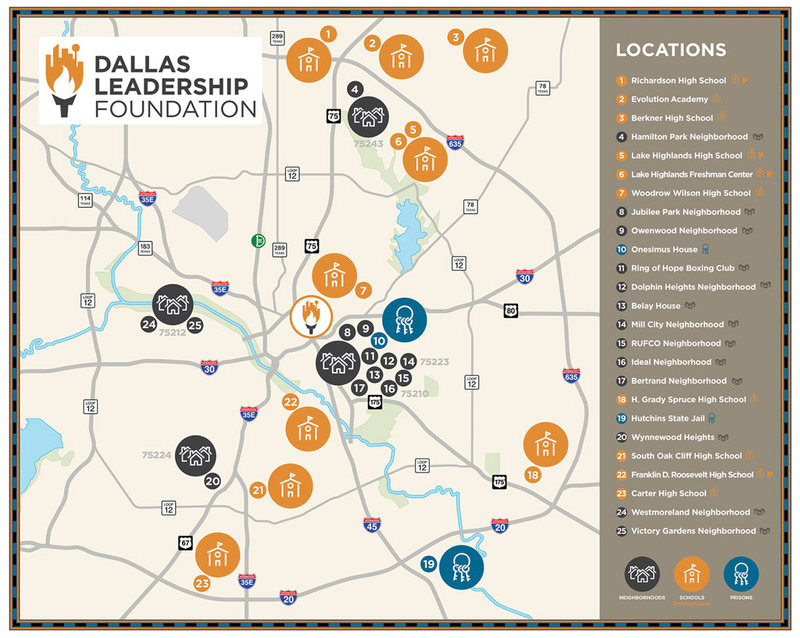 Dallas Leadership Foundation recognizes that the fire power behind community transformation lies within the aspirations and convictions of its leaders. It is this fire power that Dallas Leadership Foundation works to fuel, ignite, and spread by identifying, cultivating and supporting leaders in three focus areas. Working in isolation won't lead to transformed communities. DLF rallies leaders to dream and collaborate. We provide tools to help their leadership networks bloom and multiply across Dallas. Dreams don't have to die within prison walls. The previously incarcerated have contributions communities need. DLF collaborates with churches and other faith-based organizations to help former offenders reenter their communities in a healthy and spiritually productive way. Through a series of activities in Dallas-area schools, DLF engages youth ages 10-18 years old. They share. We listen. They ask questions about life, and we point them to Jesus Christ. They are tomorrow's leaders who need our help growing up today.